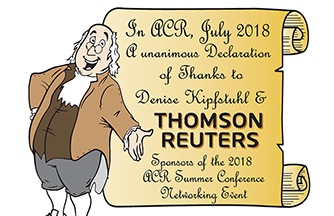 Due to low attendance (we only have three people who have signed up), we are cancelling the ACR section of the Winter Conference. I have heard from a lot of states that they either received new Secretaries of State this last election cycle or have travel restrictions due to legislative sessions. ***** PLEASE NOTE: If you reserved a room at the JW Marriott, please let me know BEFORE you cancel. NASS has a waiting list and is looking to transfer rooms. I am looking forward to seeing everyone in Indianapolis for the Summer Conference, July 7 – 10! We still have two openings on the Website/Social Media Committee, one on the Program Committee, and one on the Archives Committee. Let me know if you are interested! If you plan on attending the winter conference, please call or email me. So far we only have two people who have said they could attend. Registration is now open for the NASS 2017 Winter Conference from February 15-18, 2017 at the JW Marriott in Washington, DC. Click here for winter conference details, including NASS meeting agenda, hotel information, exhibitor info and more. Registration & Hotel: Deadline for the NASS Early Conference rate is January 24, 2017.